Have the Eagles turned their season around? Doug? Toughest game left: Week 15 at Los Angeles Rams. Simply put, the Rams are one of the best teams in football. They're scoring an average of 35 points per game -- two touchdowns more than the Eagles' average (21). Adding to the intrigue is that Carson Wentz returns to the Coliseum, where last year's season-ending ACL/LCL tear occurred. #JimmySays: ESPN's theme this week was noting each team's most difficult remaining game. Just FYI, here's the rest of the Eagles' schedule compared with the Cowboys and Redskins. The best thing the Eagles have going for them is three of their remaining games are against the Redskins (twice) and Cowboys. It’s not easy to win all three, much less beat the Rams and Texans in their other remaining games, but they’ll have their direct chances to move up the NFC East standings. Can they take advantage of it? Hard to say yes based on what we’ve seen this season, but it’s hard to write off a defending champ with that much talent. #JimmySays: It also doesn't hurt that the Redskins are rolling with Colt McCoy at quarterback. The Eagles are not dead yet. There’s a whole NFL middle class that seems to have a new must-win game every week, and the Eagles are in it. Their next one comes at home on Monday night against Colt McCoy. #JimmySays: I believe the Eagles' two matchups against the Redskins as well as their equalizer opportunity against the Cowboys are all "must win" games. If they win all three of those games, they will own the tie-breaker in the division, and the Cowboys' margin for error will be very narrow, even if the Eagles lose to both the Rams and Texans. Too bad they don't see Giants every week. Philly's beaten Big Blue five straight and nine of 10 ... but won't see them again until 2019. #JimmySays: Indeed the Giants are the gift that keeps on giving. The Eagles don’t get any style points for grinding out that comeback win over the Giants, but they dug deep the find the best of their offense and just enough defense. The key to saving the title defense with at least a division crown will be the four NFC East games they still have to play. The comeback against the Giants kept the season from coming completely unraveled for the defending champs. If the Cowboys lose Thursday night to the Saints and the Eagles beat the Redskins on Monday night — certainly a plausible scenario — a trio of 6-6 teams would sit atop the NFC East. 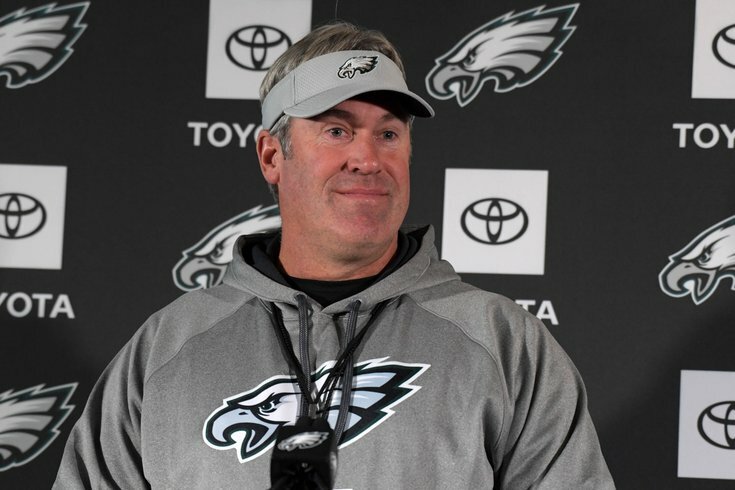 #JimmySays: It's crazy to think that for as badly as the Eagles have played this season, they would still be tied atop the NFC East in that above scenario.